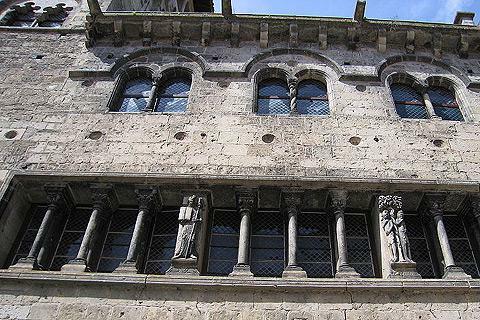 Saint-Antonin-Noble-Val is found in the south-east of the Tarn-et-Garonne department, close to Najac (Aveyron) and Cordes-sur-Ciel (Tarn). As well as being a charming French town, Saint-Antonin-Noble-Val is well placed for exploring the impressive scenery of the area and lies close to the beautiful Gorges de l'Aveyron. 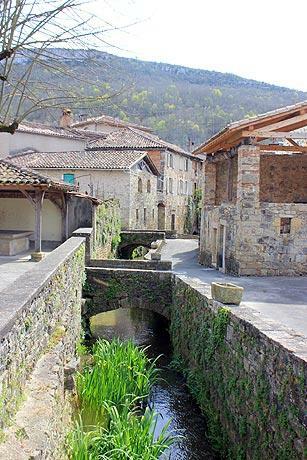 Saint-Antonin-Noble-Val has its origins in a Benedictine Monastery built in the 8th century. Some of the buildings of the main square and the surrounding streets date from the first half of the 12th century - notably older than most 'medieval villages'. 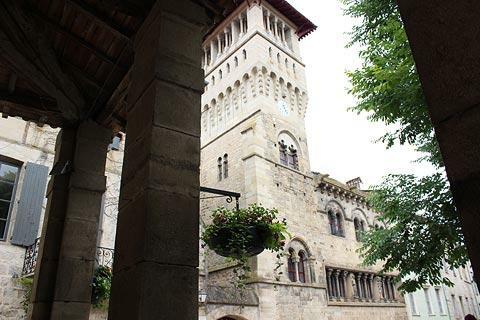 The town was historically a stopping point on the pilgrimage path to Santiago de Compostela. 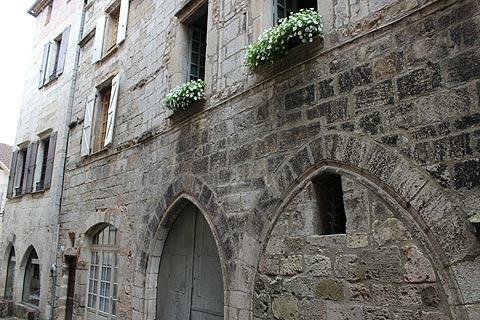 It is the medieval part of Saint-Antonin that is of interest to visitors, and has a great deal to discover in the narrow medieval streets of the town: start your visit with a look at the buildings around the Place de la Halle in the centre of the village. 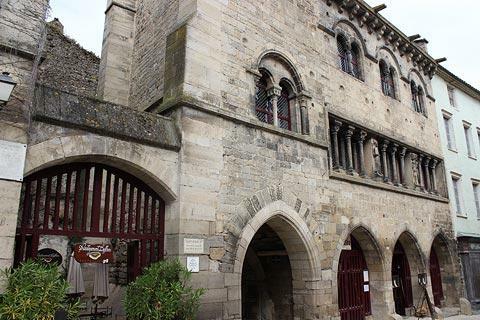 Among the highlights in this square are the medieval market hall on it's sturdy stone pillars and the great architectural highlight of the town, and the 12th century town hall with its belfry (the Town Hall now houses a small museum of prehistory). This is the oldest civil building in all of France and really is quite stunning. 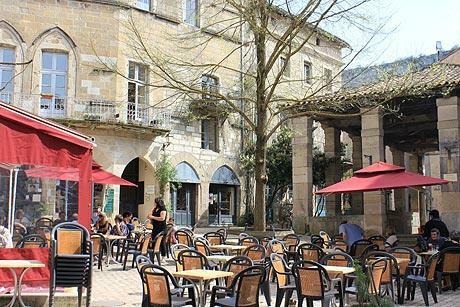 The Place de la Halle is a great place to sit out and enjoy a coffee or a beer surrounded by the superb architecture of the town. 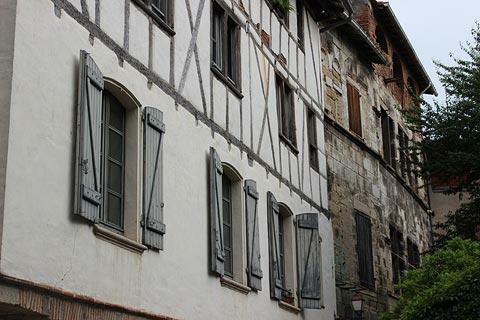 There are also numerous small streets and alleys to explore in the centre of Saint-Antonin-Noble-Val, lined with attractive houses many of which feature fascinating historical features - a small bridge, a statue, or an ornate window - which make an exploration very rewarding. France This Way comment: there are many towns in France where we describe the medieval town centres as lovely: we should make it clear that, in part because of the age of the buildings and in part because of their great number and architectural interest, Saint-Antonin-Noble-Val is among the very best of these towns. It is exceptional! 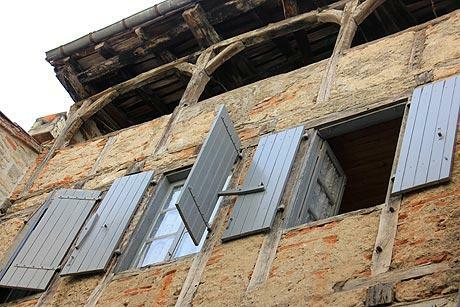 Among the most notable medieval houses are the Kings House, the lower part in stone and with ornate windows, and the upper storey half-timbered, the Maison de l'Amour, and the Maison de l'Ave Maria although you will discover many others as you explore. 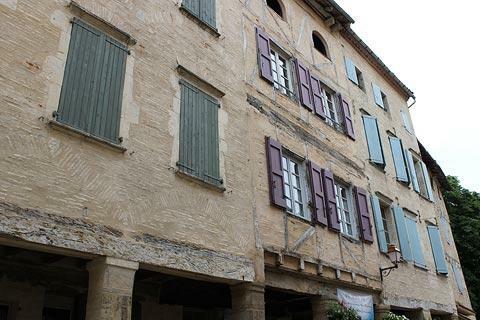 Several of the buildings in Saint-Antonin are classified Historic Monuments including the town hall; the arcades of the 'Maison d'amour'; the 'Maison Fonsagrives-Muratet' and the Moulin à huile de noix (walnut-oil mill). 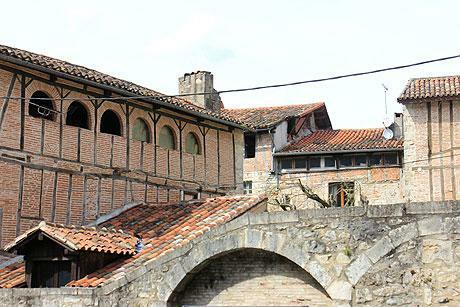 There is also an ancient 14th century tannery to see and the tourist office is housed in the attractive 18th century Convent of the Genovefains. 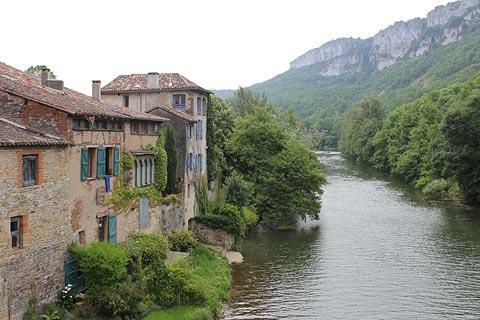 After exploring the town centre you can amble also a little way along the Aveyron River for an attractive look back across the town, then set off to the 'Roc d'Anglars', the cliff that towers over Saint-Antonin-Noble-Val, for a spectacular view across the valley and town. 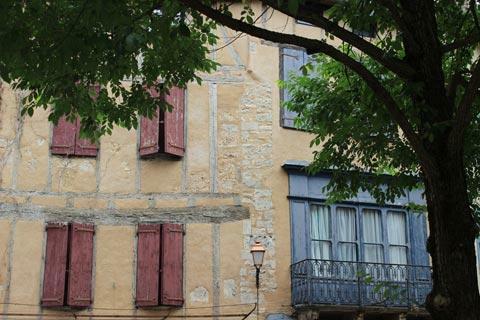 Sebastian Faulks fans may recognise Saint-Antonin-Noble-Val from the film of his book 'Charlotte Gray', released in 2001 and starring Cate Blanchett. The village was also the setting in 2013 for 'The Hundred-Foot Journey' with Helen Mirren. This is one of our personal favourite regions of France and you are spoiled for choice whether you are looking for scenic highlights such as the Gorges de l'Aveyron or small towns and villages to explore. For a change from all the scenic highlights visit the substantial cave system at the Grotte du Bosc. 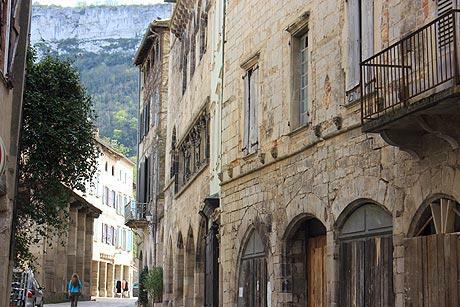 Among the villages we particularly recommend that you visit are Cordes-sur-Ciel (to the south-east) and Bruniquel (to the south-west) but you will find your own favourite hamlets as you drive around. On your way towards Bruniquel take a diversion to the left along the 'Route de la Corniche' for some exceptional views. You can find more local travel ideas in the Tarn-et-Garonne guide and the Midi-Pyrenees guide.